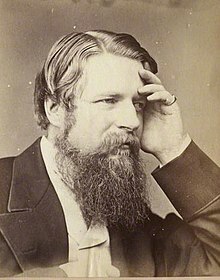 Stafford Henry Northcote, 1st Earl of Iddesleigh, GCB, PC, FRS (27 October 1818 – 12 January 1887), known as Sir Stafford Northcote, Bt, from 1851 to 1885, was a British Conservative politician. He served as Chancellor of the Exchequer between 1874 and 1880 and as Foreign Secretary between 1885 and 1886, and was one of only two people to hold the office of First Lord of the Treasury without ever being Prime Minister (the other being William Henry Smith, his successor-but-two, who, like Iddesleigh, also served in post in one of the Salisbury ministries). Northcote (pronounced "Northcut") was born at Portland Place, London, on 27 October 1818. He was the eldest son of Henry Stafford Northcote (1792–1850), eldest son of Sir Stafford Henry Northcote, 7th Baronet. His mother was Agnes Mary (died 1840), daughter of Thomas Cockburn. His paternal ancestors had long been settled in Devon, tracing their descent from Galfridas de Nordcote who settled there in 1103. The family home was situated at Pynes House northwest of Exeter. Northcote was educated at Eton and Balliol College, Oxford and was called to the bar, Inner Temple, in 1847. In 1843 Northcote became private secretary to William Ewart Gladstone at the Board of Trade. He was afterwards legal secretary to the board; and after acting as one of the secretaries to the Great Exhibition of 1851, co-operated with Sir Charles Trevelyan in framing the Northcote–Trevelyan Report which revolutionized the conditions of appointment to the Civil Service. He succeeded his grandfather, Sir Stafford Henry Northcote (1762–1851), as 8th baronet in 1851. He entered Parliament in 1855 as Conservative Member of Parliament for Dudley with the support of the influential local landowner Lord Ward. However, tensions between Northcote and Lord Ward soon arose, in particular over a vote over conflict with China, where the two men supported opposite sides in the vote. Northcote subsequently decided not to contest Dudley again and stood unsuccessfully for North Devon in 1857. He returned to parliament in the following year, when he was elected for Stamford in 1858, a seat which he exchanged in 1866 for North Devon. He was briefly Financial Secretary to the Treasury under the Earl of Derby from January to July 1859. Steadily supporting his party, he became President of the Board of Trade in 1866, Secretary of State for India in 1867, and Chancellor of the Exchequer in 1874. In 1870, during the interval between these last two appointments, he was the Governor of the Hudson's Bay Company, North America's oldest company (established by English royal charter in 1670), when they sold the Northwest Territories to Canada. Northcote was one of the commissioners for the settlement of the Alabama Claims with the United States, culminating with the Treaty of Washington in 1871. On Disraeli's elevation to the House of Lords as Earl of Beaconsfield in 1876, Northcote became Leader of the Conservative party in the Commons. As a finance minister he was largely dominated by the lines of policy laid down by Gladstone; but he distinguished himself by his dealings with the debt, especially his introduction of the new sinking fund in 1876, by which he fixed the annual charge for the debt in such a way as to provide for a regular series of payments off the capital. His temper as leader was, however, too gentle to satisfy the more ardent spirits among his own followers, and party cabals (in which Lord Randolph Churchill, who had made a dead set[clarification needed] at the "old gang", took a leading part) led to Northcote's elevation to the Lords in 1885, when Lord Salisbury became prime minister. Taking the titles of Earl of Iddesleigh and Viscount St Cyres, he was included in the cabinet as First Lord of the Treasury. In Lord Salisbury's 1886 ministry he became Foreign Secretary, but the arrangement was not a comfortable one, and his resignation had just been decided upon when on 12 January 1887 he died very suddenly at the First Lord of the Treasury's official residence, 10 Downing Street. Northcote was elected a Fellow of the Royal Society in 1875 and Lord Rector of Edinburgh University in 1883, in which capacity he addressed the students on the subject of "Desultory Reading". From 1886 to 1887 he was also Lord Lieutenant of Devon. He was not a prolific or notable writer, but amongst his works were Twenty Years of Financial Policy (1862), a valuable study of Gladstonian finance, and Lectures and Essays (1887). His Life by Andrew Lang appeared in 1890. Northcote was appointed a CB in 1851 and a GCB in 1880 and was sworn of the Privy Council in 1866. Northcote married Cecilia Frances Farrer (died 1910), daughter of Thomas Farrer and sister of Thomas Farrer, 1st Baron Farrer, in 1843. They had seven sons and three daughters. His second son, Henry, 1st Baron Northcote, was Governor-General of Australia. Another son, Amyas, later became known as a writer of ghost stories. In the aftermath of the British Expedition to Abyssinia, Northcote built up a small but prestigious collection of Ethiopian artefacts that is now in the British Museum. The 1881 Census shows him living next door to Lord Randolph Churchill MP and family, at 30 St James Place, Westminster. ^ Although The Earl of Iddesleigh is the 8th Northcote Baronet of Hayne, by custom the post-nominal of Bt is omitted, since Peers of the Realm do not list subsidiary hereditary titles. ^ Williams, William Retlaw (1897). The parliamentary history of the county of Worcester. Hereford: Jakeman and Carver. p. 182. ^ Lang, Andrew (1890). Life, Letters, and Diaries of Sir Stafford Northcote, First Earl of Iddesleigh. Edinburgh and London: William Blackwood and Sons. pp. 109–113. ^ Lang, Andrew (1890). Life, Letters, and Diaries of Sir Stafford Northcote, First Earl of Iddesleigh. Edinburgh and London: William Blackwood and Sons. pp. 147–151. ^ "Fellow Details". Royal Society. Retrieved 27 January 2017. ^ "Review of Lectures and Essays by Sir Stafford Henry Northcote". The Athenæum (3113): 826–827. 25 June 1887. ^ British Museum Collection, britishmuseum.org; accessed 24 July 2017. This article incorporates text from a publication now in the public domain: Chisholm, Hugh, ed. (1911). "Iddesleigh, Stafford Henry Northcote, 1st Earl of" . Encyclopædia Britannica. 14 (11th ed.). Cambridge University Press. p. 280. Wikimedia Commons has media related to Stafford Northcote, 1st Earl of Iddesleigh.